Gorgeous set! Love pearls and my sapphire birth stone. They're gorgeous together on this set. Wish there was a ring that matches. Sapphires are a bit lighter in color than the photo shown but still very blue. 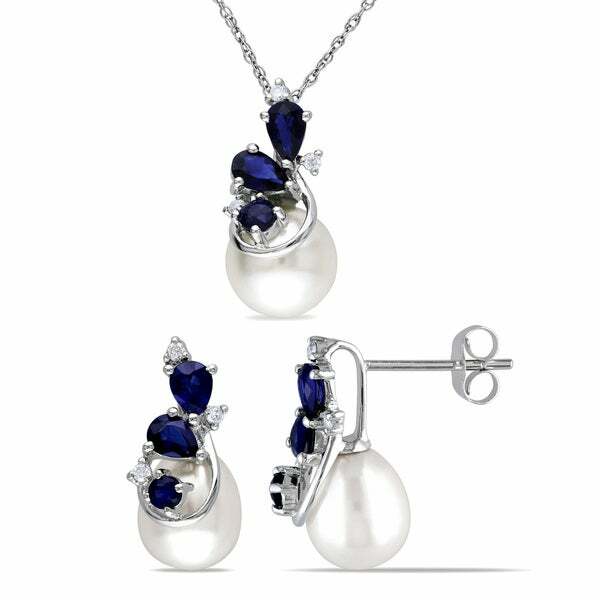 This Miadora Signature Collection three-stone pearl necklace and earrings set is set in white gold and features cultured freshwater pearls, sapphires and diamonds in a unique clustered dangle design. This set is a perfect gift for someone you love. All weights and measurements are approximate and may vary slightly from the listed information. *T.W. (total weight) is approximate. 1/10 carat T.W. may be 0.08 to 0.12 carat. Treatment code E (Sapphires) and N (White Diamonds and White Pearls). See Treatment Guide for further information. I bought this for my wife and it’s her birthday. She absolutely loves the jewelry. Beautifully made. The pendant does not balance correctly in that it tends to turn sideways. The post clips do not fit tightly over the metal post. So be careful, they will slip off the post! Absolutely beautiful!! Worth the money. great price for a tasteful setting.